From the other side of the equation, I’ve heard lots of dog lovers struggle over what to do when company comes and their dog doesn’t do well with visitors. One holiday season, years ago, I had five “do I have to kill my dog cases?,” all serious bites to visitors, on December 23rd and 24th. So sad. Here’s my generic advice about holidays and dogs and visitors. I’d love to hear what solutions you’ve come up with for yourself or advised for others. Bottom line? “Dog Sitters. Don’t leave home without them.” Of course, in some cases bringing your dog just adds to the fun, and if that’s the case, then Eeeee Hah, bring ’em on. But if you’re not sure, then discretion is the better part of valor. 2. If visitors are coming to you, do what most professionals do, and thank the heavens for dog crates and X-pens. It seems to be the pro’s who are most likely to put their dogs away to prevent problems, rather than crossing their fingers and saying “I think it’ll be okay…”. Anytime I hear myself asking that question, I know to change my tune and do whatever I need to do to know that it’ll be okay. I never hesitate to err on the side of caution if there is even the slightest chance of trouble between a dog and a visitor. Most trainers and behaviorists don’t either; nothing like years of hearing about serious bites and traumas related to dogs. ARe kids coming over and you’re not 110% sure about how they’ll behave around your dog? Not sure either how the kids will behave? Then start with your dog safely contained, meet the kids and then decide how they’ll interact. Is Uncle Johnny, all 6 foot 7 of him, driving in from down south to meet your dog who is uncomfortable around unfamiliar men? Aren’t you glad you crate-trained your dog? Start cautiously: Dog in crate when visitors enter? Observe carefully: Watch interactions like a hawk at first. Manage obsessively: Know your dog’s signs of discomfort and minimize the potential of any problems. This all might sound a bit excessive, why not just let dogs be dogs and let things play out? Here’s why: A dear friend just had his beloved dog bite a guest (equally beloved) during Thanksgiving dinner. “Why didn’t I put her in her crate?” he asked, after the bite and the trauma. “Because you’re an optimist and not a professional trainer,” I said, but in the future, management is going to have to be Job #1 in his treatment plan. This kind of management becomes second nature to trainers, doesn’t it? But we had to learn it, and anything we can do to let people know that it’s OKAY to separate dogs and guests sometimes, the better. What about you? Tell us your pet and holiday stories… from funny to illuminating to oxytocin inducing. I can’t wait to read them. MEANWHILE, holiday preparation is in full swing at the farm. I spent much of Saturday baking loaves of carrot bread, cheese breed and herb rolls for our holiday packages for friends and neighbors. 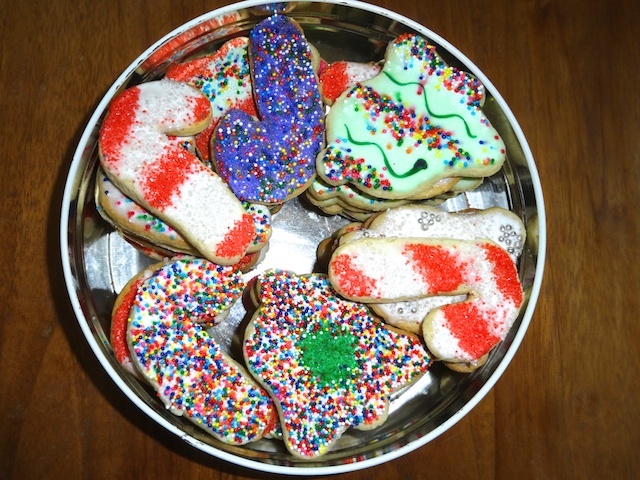 Jim made his great grandmother’s famous Christmas cookies, 150 of them, and we spent half a day decorating them together. Now I just have to keep from eating them before they get distributed to friends. Wish me luck. This is great advice, and I wish more people were less concerned with the perception of a crate being mean than with properly managing their dog’s and guests’ stress. The crate command is my dog’s most reliable command bar none; she SPRINTS to her crate for her reward and settles down immediately. I would never subject my very sensitive dog to my extended family by bringing her along. My cousins are terrors who treat their own dogs quite poorly and roughly, and though I’m near certain my dog would not lash out, I know she would not enjoy her time there at all. How timely an essay as we prepare to take our dog for the first time to our daughters’ houses over the holidays! First, a quick brunch to the first house with a large german shepherd (v. our 12-pound terrier mix), parents and two teenage boys. Then we take a 6-hour trip and stay for a week with our daughter, husband,two granddaughters and 4 chickens. The humans have all met our dog. I am considering our little guy like a toddler where there is an inverse relationship between age and all the accessories that go with them. So in addition to food, toys, and favorite blanket we are taking two leashes (one short and one longer for walks), carrier, crate, and room divider. This way he can be restrained on leashes, in a carrier, in a crate, or to certain rooms. Your blog reinforces my packing list and that I should use all these items! Thanks! Yes, my mother left a roast cooling on the kitchen counter while we went to church and my 6 month old dog stayed home, uncrated. When we rushed home after the service ended, the roast was on the counter, untouched, but the pan of cinnamon buns that had been cooling beside it was upside down on the kitchen floor with only raisins – licked clean – to show anything had ever been in it. My mother made cinnamon buns for my dad just once a year and that year the dog ate them. He still calls her Cinnamon Claire sometimes, more than a decade later. This year will be youngster Allie’s first visit with my family. The crates are definitely coming and my SIL, the only non-dog-lover in the family, will not be there this year so I have a little less to worry about. Hi. I started reading this blog in July when my son went to England for 6 months leaving his 2 dogs with us. That made 4 dogs at our house and it has been crazy, hairy and even scary at times. Reading this blog started me in pursuit of a new, to me, style of dog training. A lot of reading later, I may not have managed massive behaviour changes (mine or the dogs) but I have managed some. Thank you for my sanity. Best wishes for the season. This holiday story takes place 30-some-odd years ago. In those days, our dogs were much more free spirits due to our incredibly lackadaisical approach to having dogs (when I look back now I cringe). Luckily, our dog Sadie was smart, bonded to us, and had incredibly good instincts. She was our first dog as a couple (we didn’t really deserve how amazing she was), and she will always remain our queen of dogs. We had a notion that it would be better to let her go through at least one estrus cycle before we had her spayed (we may have been secretly thinking it would be great to have her puppies). But with that, we weren’t always so careful to keep her in check during these times. Sadie got pregnant, and we learned how to do simple math. Oh no, we reassured him, she’s not due for another week. That night, we were sitting around chatting, and Sadie started pacing. She went from room to room to room, pacing and whining and digging in corners. We looked at each other, counting backwards from when we “thought” she had been impregnated, calculating the gestation period, around 68 days, or was it 60? Regardless of our inability to keep track or count, it was time! We made a whelping box in a warm, quiet room for her, and stayed with her all night. The first pup came quickly. Sadie was a bit confused, but then the next one came, and she settled right in. She knew just what to do with each pup and eventually gave birth to eleven, healthy puppies. Trying to find a Vet to check Sadie out on Christmas Day was another unplanned holiday gift, but we managed to interrupt the town Vet’s dinner long enough to give her a quick once-over. Once it was time to go back home, we were faced with the challenge of how to get a nursing mom and eleven puppies home safely, in winter, in a car with minimal heat. We turned the back seat area into a traveling puppy nest. We stuffed things on the floor, put up boards on either side, and created a surface that filled the entire back and covered it all with blankets. We hit a snowstorm on the way home, which made the five hours stretch into seven. But, we all made it back safe and sound. The puppies all found good homes, Sadie was spayed and she taught us many important lessons over the course of her life. Thanks for all you do, Trisha, and Happy Holidays to everyone. When we adopted our dog, we actually had holidays in mind. At our extended family Christmas there were 15 people and 7 dogs. We have a lot of experience managing large groups of dogs, so we have a system for meeting new dogs: once they prove friendly, they get to do an initial meeting loose in a large fenced in area, where they can run around and exhaust themselves before they ever come inside. Our dog is not able to be crated (it’s a very long story and one we have worked on extensively with a very good trainer with no luck…we’re taking a long break and hoping to re-introduce when she’s older) but she knows a “place” command and her bed is her quiet space. So we always bring it and put it in a corner, and she knows she can retreat there to nap or sleep when she needs to. She’s pretty good about giving herself time outs, thankfully, but when we first got her we did have to manage her and take her to other rooms to hang out with us alone for a while to take the edge off. I have discovered that a Thundershirt and a really great marrowbone are FANTASTIC for helping Blue chill out when there are small children around. (Of course I still have to ensure that they leave him and his bone strictly alone!) This also works when a lot of people are arriving; he’s good once people are actually in the house, but the doorbell still sets him off unless he’s well occupied. We have two malamutes. Both love people. Biggest problem occurs when someone first enters the house and they compete with each other for the newbies attention. Secondly, food. Our female is extremely food oriented and likes to intimidate people for a bite of their sandwich. Crates are mandatory for us. Glad we listened to people’s advice and have them both crate trained. The crates don’t stay up all year round but are perfect for times like these. Despite being raised in a home full of dogs and cats, my sister has always been afraid of large dogs. That extended to my bomb-proof, 100-pound, incredibly gentle, certified Therapy Dog, German Shepherd. Sis shared this phobia with her children, thankfully, it never infected her daughter. Family is over for Christmas and suddenly there is horrified screeching from the family room. In a quiet corner were small girl feet sticking motionless out of the dog crate and the sound of “growling”. Naturally, my sister assumed the worst and was too terrified to check further, she stood there screaming/weeping, unable to bring herself to look into the crate. There in our dog’s giant crate were my Shepherd and my niece, curled up together, my niece asleep, the dog her pillow. The dog had been snoring (until the screaming started) and the sound was reverbing off the wall the crate was against. The Shepherd smiled the most glorious, calm smile as I peeked in, she was watching over this hairless “puppy” as she slept. We’ve had many Shepherds through the years and not all of them were kid friendly, but this one particular dog was the most trustworthy, gentle soul. (I miss her every day.) I was never worried with her being around anyone. Our current Shepherd is not a kid dog. She will introduce herself, mingle for a few minutes to see if there are any treats involved, then self-“exile” to our bedroom with a favorite plush toy. The kids know better than to go into the dog’s room when she’s taking quiet time for herself. You have to be honest with yourself about how much interaction your dog can take and err on the side of keeping everyone safe. For the first 5 years of my Gracie’s life (30 lb cardigan welsh corgi), whenever we traveled she stayed with our neighbors, who she adores. When they retired and moved away, we naturally didn’t see them as often, but Gracie is still very attached (cardis are incredibly attached to “their” people). Some time after they moved away, they got a rescue – a 40lb young hound mix that spent most of his life outdoors, tied out, not socialized. With LOTS of work & thanks to a wonderful trainer, Cody is much, much better. Anyway, we went up to their home for their annual post-Christmas dinner. It’s always 20+ people (family & friends) & fairly hectic. We had done this for years & Gracie always attended. But Gracie always did well; she loves lots of people & all the attention. She got along well with Cody the few times they had met, so we brought her along – but this was Cody’s first Christmas party. Oh, you know where this is going already, don’t you? Cody was stressed, over-excited, tired and both dogs were possessive of the same people. Some of us are in the back bedroom after dinner, discussing some renovations that our friends did & we hear a dog scuffle. Out we all come & when we get to the dining room, it looks like a crime scene. Blood everywhere. Both dogs are sitting there, not making a sound. But Gracie’s ear is slit & bleeding profusely (corgis are SO stoic!). Not a mark on Cody. Off we go to the emergency vet – $1,000 later, she’s the proud owner of 8 stitches in her ear and an Elizabethan collar. doG bless our good friends, they split the bill with us. Needless to say, Cody is now crated during the party & Gracie stays home. It was totally our fault – we set them up to fail. Lesson learned. As a dog walker, petsitter and anxious BC owner I can say without hesitation that except for the very outgoing pup, dogs like to keep to their routine best. That can be at my house if we have built a relationship but with their beds and toys, or even better at their house. The least amount of stress comes in a quiet house, where the dogs are attended to regularly, have good walks, good dinners, good play session and lots of relaxed sleep. The small dogs need lap time the larger healthy dogs needs walks, runs, sniffs and long naps. The worst situation is wrong food, wrong companions, being alone too long, being chased and cornered from well-meaning children, overbearing adult humans wrestling, introduction of a new dog without introduction. And out of control energy. And that spells Christmas! I tell my clients to simply think: what would my dog like best, what would make this holiday relaxed and pleasant for all involved? Keeping the dogs home, hire a trusted dog walker, teach dogs crate and xpens, arrange a comfy space in a room the dogs like to hang out. It’s not just the grumpy dog you need to watch. I remember with a mix of fondness and fear when my smooth Collie, who adored people, just had to show off one of his tricks during a New Year’s gathering of our octogenarian relatives. Yes, it was the one where you go “through” the human’s legs, whether they’re wearing skirts or whatever. Fortunately, our guests were “floored” (not knocked down) by his behavior and thought it was hilarious. Another doggie mishap dodged. Aunt Polly is definitely not invited if she just doesn’t like dogs! This year we’ll have 4 dogs and two cats at home. My mom (hostess) has 3 dogs of her own. I always go for 1 to 2 months with my dog and my cat. And my aunt (who has 5 dogs and 3 cats) is bringing one of her cats because he’s only 2 months old and she doesn’t want to leave him with the person who is caring for her animals because she’s afraid that since he’s so little he might escape. One of my mom’s dogs has never been around in the holidays since she adopted her this year. Usually, we had 3 dogs and, last year, we added my cat for the holidays. People who come over the holidays are all (or all but one or two) people with whom my mom’s dogs interact on a regular basis and my dog used to interact with them on a regular basis too. We are usually around 20-22 people (with 10 already living in the house, since my aunt, uncle, and 3 kids stay with us for a week or so, so the pets are okay with these 10 people). My cat is confined upstairs since one of my mom’s dog is not cat friendly (and the other one, we’re not really sure). The non-cat friendly dog is a 15 year old mixed breed (with some greyhound heritage? or something, it’s really mixed), we have her since she was 6 months old. We’ve never had a problem with her and big crowds. So she gets to hang out all night with people. The other dog is a 6 years old GSDxHusky (or so we think), we have him since he was 1.5 years old. He was not okay with lots of people when we first brought him home, he’d bark at them and bite their feet in a playful and completely overexcited manner (so pretty much a recipe for disaster). He’s always outside during Christmas, though I’ve lately managed to convince my mom to let him in as the guests are arriving. Kids are usually upstairs at that time so no kid risk. He’s actually pretty good with lots of people now (lots of time has passed since he did that! ), but my mom is still scared he’ll upset the guests. I wouldn’t trust him to be around all the time, particularly with my not-pet-safe cousin (she has some issues), but I think he’d do okay with some supervised time while we’re having dinner. What do you think? I say dinner because we’re mostly sitting down and so. The other dog is my dog, who is perfectly okay with large crowds and is pretty much no problem at all. He is very socialized as I usually take him to a lots of places and lots of other people’s homes. The only thing he might do is steal your seat when you aren’t looking, as he is allowed to sit pretty much everywhere in my home! He does it at least once a year. With so much food and so much overexcitment, when someone goes to serve himself more food (we have a table with food options and so, everyone brings food to share and you pick whatever you want to eat), he’ll jump up his seat and sit on the table like a little person. It’s hilarious, because he doesn’t steal food or anything, he just sits looking at all the food. I have a question. Since there are fireworks, we usually confine the dogs in a room (one pet per room) so they won’t get scared. Both my dog and my cat usually do okay, they don’t seem to mind the fireworks. The old dog does pretty good too (just some barking), and the other dog was always drugged (sedated) for the fireworks, so we don’t know how he actually reacts. This year (and in the future) I would prefer to not drug him. Would you advise to confine two (or more) dogs together or do you think that they’ll get too upset and something could happen? The new dog (some sort of beagle mix) and the GSDxHusky have a pretty good relationship, they love each other and are always together. So I don’t know if separating them would be more stressful or not. I’m concerned about the size difference if something happens. Particularly since this is the first time this dog would go undrugged and we don’t really know how the other dog would react. Great reminders to keep everyone safe!! This summer we had out of town guests – 9 in all, including three kids – 10, 3 & 1 yrs of age. We were thrilled to have family & as much as my #70 Aussie is ‘family’ too, I had to kennel him for the safety of everyone involved. A wonderful stress-free time was had by all!! I have one dog with fear aggression issues. We’ve worked hard to make him comfortable around people but small children are still an issue. My other dog has serious barrier frustration issues. Almost 3 years since I got him and he’ll now go into a crate to eat but he won’t settle in the crate for long. Consequently the holidays are best done at someone else’s house. My dogs are going on their holidays to boarding kennels for Christmas. A few years ago I decided it was too cold to send my old boy to kennels. He was never crate trained, but he was getting old and slow and all the guests were under strict instructions to keep an eye on him, as he was a well known thief in his youth. The guests went to church and I jumped in the shower. Old dog was asleep on my bed (holiday treat). When I got out of the shower, he was still asleep on my bed. But a box of chocolate wrappers was strewn all over the floor together with a few discarded toffees. The chocs were hidden under a pile of quilts because I really am not stupid! He pooped wrappers for days. No ill effects from the chocolate. That boy knew what he liked and he knew how to get it. Lucky for me my big holiday party was for all my horse barn friends. My two Aussies greeted everyone with noses and could tell they were kindred animal people by their smells and manner probably and happily sat for petting if anyone was obliging. Only problem was when one friend put on a Santa suit and one of my dogs kept barking at him if he moved and even when he took it off it didn’t matter so it was off to a people less room for him (dog not person…) audit was probably time anyone as he isn’t used to so any people in the house. No kids though – I would have left them upstairs in my bedroom if little kids were coming as I don’t trust that interaction without my full attention. Given half a chance we go away to the snow – yup, we are introverts and don’t like family gatherings, that is to say my hubby does not like my family much and I do not really love being with his family. So either we split up or we stay at home. We cannot take the dogs to my family: my sisters lives quite far away and she has two little dachshunds with I am afraid my two gentleman will not get along with (they tend to chase small squeacky animals …. ) and putting the four dogs in one room with my one year old nephew means me being stressed out at the beginning already. It is just not worth is, so they stay at home. If we go to my sister in law, she has cats, so the dogs won’t come. But if we have company, they are perfect, ok they do a little begging but usually they just drop of somewhere and snore through the noise. Although I am a bit careful with very small children, then I would probably just put them outside in the garden for a while. Well anyway, I not in a very festive mood at the moment, we’ll just see what de holidays bring. Nobody I have spoken to is really looking forward to them, odd isn’t it? Love your cookies though! They brought a smile to my face. Every year around the holidays is always a frustrating time when it comes to my in-laws and our dogs. It’s always a lot of extra planning because my in-laws don’t really want our dogs at their house when my brother and sister-in-laws are there. We live 2 hours away from them so there’s an extra logistics challenge. Thankfully, my mother loves our dogs and they are always welcome at her house. However, I don’t think she should be expected to always dog sit just because the dogs aren’t welcome at my in-laws. My in-laws don’t like large dogs (we have two greyhounds). They are ok with toy breeds, though. My sister-in-law has a yorkiepoo who my in-laws dog sit all the time and let her sleep on their bed. If our dogs even go near their room, they are shooed away and not allowed in – so they don’t get on the bed. There are many more examples of inequity that I won’t list here. The double standard is especially frustrating, since one of my dogs is a therapy dog. My in-laws claim there is no double standard. A couple of years ago, they suggested that we could bring the dogs as long as they were either confined to the 3-season porch (with space heaters) or confined to their non-finished basement. I suggested that they be confined to a bedroom in the house or I could keep them on-leash, out of the way. However, my mother-in-law got angry with me and asked why I was arguing with her. This has lead me to believe that my sister-in-law (owner of the yorkiepoo) is really the one behind why our dogs can’t be at their house. Whenever she is there our dogs, basically, cannot be. Whenever she is not there, our dogs can be. It’s so frustrating because it’s obvious to me that the reason our dogs are shunned around the holidays doesn’t really have to do with the reasons they state – they are large, there is not enough room for them when everyone comes home. It’s due to my sister-in-law (owner of yorkiepoo) not being comfortable around large dogs. It’s definitely not a problem with dogs in general – the yorkiepoo is always welcome at holidays and always has free rein of the whole house. I wish they would just be truthful with us about why they don’t want the dogs there. I also wish they would get to know our dogs instead of pre-judging them due to their size. To me, a dog is a dog whether it is 5 pounds or 150. I guess it will be their loss, not getting to know two sweet, wonderful dogs. I went to a work Christmas party last week which was kindly hosted by one of the employees at their house. Partners and children of staff were all invited. The hosts owned 2 senior cockers. The small children who arrived immediately wanted to pat the doggies and did so without consent. So that alarmed me. What was more alarming is my partner said that’s strange every time I’ve come to this house all they do is bark at you and I think they want to bite you. WHAT?! YOU HAVE A BITE HISTORY?! And still you *hoped* with a house full of strangers and small children that your dogs wouldn’t bite? In fact you expected them to? Why would you subject your dogs to this environment? What do you think the consequences of your dogs biting someone would be? My lady friend was always panic stricken when she first came cross fireworks.I did not bat an eye lid but my older and no dead second dog taught her about it. No idea where she had it from as I picked her up on a motorway. Any tip on this problem other than pills or loud music? Before visitors arrive I put both Nina & the current guide dog puppy into their front-clip harnesses & on leash, & stand in the kitchen, wearing a bait bag stuffed with kibble. I reinforce every offered or maintained sit as people come in. Once they’re all seated. I sit down, & then reinforce every offered or maintained down, while keeping leashes short enough that they can’t reach people to self-reinforce by lap-climbing & face-licking. They settle pretty quickly, & then I just reinforce check-in. When it’s time for refreshments, I crate the dogs with frozen peanut-butter kongs so that I can serve unencumbered. With previous dogs, I could just crate them from the beginning with a food toy, but Nina will scream herself into a frothy frenzy if I separate her right away, & she has a high-pitched shriek that is incredibly distracting in my small house. There’s also no motivation like seeing another dog earning the goodies, so mere kibble gains a lot of value, & I can let them earn most of the next meal without upsetting anyone’s digestive system with a high volume of richer treats. However, a few years ago my Aunt bought a doodle. My Aunt and her partner assure us that “Chester is so well behaved”, “Chester goes to dog parks all the time he loves other dogs”, and “oops we forgot Chester’s indoor booties at home.” Meanwhile, Chester is resource guarding my dogs’ toys, my dogs and my parent’s dog’s beds, and my Aunt and her partner! Yeah ok. “Oh, he’s just being a normal dog” they say, as he snaps at my Aussie and backs her into a corner. Yeah ok. He doesn’t seem to care about the older males, just my girl (who is the same age as him). Lots of luck trying to keep the cookies from being eaten by dogs or humans. Happy Hollidays. One more thing I wanted to mention…when there are overnight guests, one issue is that people tend to keep things in their bedroom that they would ordinarily keep in a medicine cabinet. Often on top of the nightstand or book case near the bed. This creates a hazard for both dogs and kids. I’ve even seen people leave pills on a saucer! Provide your guests with either a nightstand with a commodious drawer, or a child safe, dog safe chest on top of the nightstand, and encourage its use. Choose something large enough to hold a standard toiletries bag. “Better safe than sorry!” said cheerfully is usually a more effective encouragement than dire warnings. It’s a small thing, but can make a big difference. I’m loving all your stories: smiling, groaning, covering my eyes… Love LisaW’s story about the surprise puppies (Merry Christmas! ), Robin M’s suggestion about a Thundershirt (but don’t slap it on your dog a few minutes before the kids come…try it out first! ), Sandy’s added advice, and Virginia’s slightly scandalous Collie trick story. To Paula and the dog fearful of firecrackers, I’d suggest leaving the dogs together for sure. It sounds like that is what they are used to and enjoy, so that is important right off the bat. I would check on them often though! dieta: Can I rent the cottage around the corner from your house too? But could it be around the corner from my house? Then I wouldn’t have to clean up all the dog hair when company comes, right? To Margaret: Way to manage a difficult situation! Kudos to you! Thank you Robin for that reminder about keeping medicines away from dogs. I never would have thought of that, but it’s a great point. Thanks for making it. To Andrea and your lucky, chocolate-eating dog. Oh my… how easy it is to forget that dogs use their noses like we use our eyes! I remember someone saying to me once, “I didn’t think the dogs could find the food, it had a towel over it.” Ha! And lastly (for now), to Kelly: I’d put my dogs in the basement with lots of wonderfully stuffed hollow toys, check on them often–bringing them lots of wonderful treats and telling them how lucky they are not to have to deal with Devil Doodle! Very timely post! Obi, our new guy (4 year old happy-go-lucky BC), was very content to spend Thanksgiving in a crate in the car in the garage away from the pandemonium we hosted, and Habi (10-year-old BC) much prefers calm but knew all the participants, so she stayed in a crate by my chair, and everyone was cool. Christmas will be a family gathering eight hours away of ten adults, three kids 5 – 11 years old, and a young guide dog puppy. We had planned to leave our two dogs at home with their favorite dogsitter, the simplest solution. BUT – Obi sliced his leg just above his hock a week ago, and cannot leave the wound alone. Mister Loves-a-challenge Contortionist, even hobbled and wearing a cone, can remove the bandage, sock, oversock and duct tape armor and pull out his staples (the cone does slow him down a little and is an early warning signal when he starts to go for his leg). We’re now to the point of never taking our eyes off him during the day and sedating him at night. Trisha, I believe your standard reply to anyone telling you about their smart dog is “I’m so sorry!” LOL – we get it! He now gets his 3x/day kibble doled out over the course of an hour, dribbled throughout the house so he has to search for every morsel, and he’s getting frequent training sessions, in hopes of mentally tiring him out. Anyway, we don’t feel comfortable saddling our dogsitter with this challenge, so the dogs will come to Portland with us. We would normally manage both with crates, but Obi’s cone doesn’t work in the crate, so I’m checking with friends to see if we can borrow an X-pen for a safe zone for him. This is not a holiday we would have planned, but oh well. We’ll deal with it, and much appreciate all the tips everyone has added above. Happy holidays to all! Ranger and his canine cousin Louis would be at Grandma’s at Christmas and with some basic management everything went fine but sadly Louis succumbed to cancer and last year there was a new canine cousin, an energetic adolescent without Louis’ social skills. Comments from the in-laws such as “I hope you bring Ranger so he can put the new dog in his place” and more alarmingly, “I think it will be alright” (those dreaded words that once uttered almost always end badly) made me very uncomfortable with the idea of bringing Ranger to Christmas dinner. Ranger is pretty bomb proof and very good at handling other dogs but why should I put him in the position of having to manage a rude adolescent. And I know my mother-in-law and how stressed she would get if Ranger did need to ‘put the pup in his place’ and her stress and fussing would only escalate any problems. Ranger stayed home for Christmas because there is no way I’m ever going to knowingly put Ranger in a position to have a bad experience. I’d rather have spent Christmas with Ranger but it’s only one day. Meet “Aunt Polly” at the door with a martini and just keep em coming. And I have no problem visiting anyone anymore with my little pack since I converted a high top van into a small RV. Not only are the dogs well acclimated to crates, they are acclimated to crates in the van and traveling. A great side benefit is that I have my own comfy bed with me where ever I go. I remember one visit to friends where the “guest” room reeked of mothballs. A friend does huskies rescue and we were at his house for a gathering. It was an all day thing so we had picked up breakfast on the way to his house. We opened the door and were welcomed by his pack of 4 or 5 dogs (except for the one newbie who was confined to her own room, for safety’s sake). He yelled for us to go ahead and enter; as soon as we stepped forward, the dogs stepped back until we were far enough into the room they broke apart. My SO sat down on the couch to eat his sausage biscuit and immediately had company. His right arm, the one with the food, was free and part of that side of his chest. The rest was covered in dogs. There was one dog at each knee, one dog wedged between us, and one dog on the back of the couch. Not one snatched at the food or made any untoward gestures nor noises or even drooled. They just watched and hovered. Our friend walked by and didn’t see my SO. The dogs had him covered to that extent. But they were very well-behaved and didn’t even shake the table in front of the couch. They just wanted my SO to know that if he needed _any_ help eating that biscuit, they were there. Of course, only the well-trained dogs were allowed to mingle. And they were given time in the yard to work off energy at intervals. We have always taken our little dogs to family birthday parties and holidays. My niece is now dating a guy who is allergic to dogs. They ask us to keep our dogs at home. Hope you are not offended. Really? Yes we are. What would you do? I wouldn’t hesitate to leave the dogs at home. Allergies are often serious medical conditions. When I’m around things I am allergic to I can go from red, itchy painful eyes to an inability to breathe. So, why would you not leave the dogs at home? hey! the article is a gem and comes in handy at this time of the year. It would be great if you could share a few tips and tricks of managing dogs post the festivities are over. as we usually experience withdrawal symptoms in dogs many a times once the party is over.